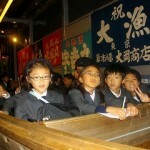 On October 27th, Thursday, the grades 3 and 4 went on a field trip to the Urayasu City Folk Museum. The museum is divided in two areas, one outdoor area and one indoor area. 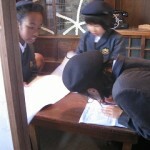 Students got to see and explore around 8 shops/houses of old Urayasu. These houses are actual old houses, not replicas. 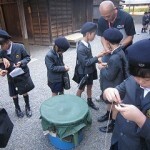 A lot of the tools found in and around the houses were real as well and students were able to feel and learn the old lifestyle of Urayasu. In the indoor area of the museum, students also watched a video about “Higata” (a brief history of the tidal flats of old Urayasu), and saw the fishing tools exhibited throughout the museum. The students also got to see the woodshop area of the Bekka Boats as well. The weather that day was sunny and fair and students enjoyed their lunch outside the museum area in a picnic style with their classmates.